***We’ve adapted this recipe to fit our Whole Foods lifestyle by using rolled oats and sucanat. See printable recipe below. ***I love granola bars! I buy them when I can get them really cheap (which is this time of year). 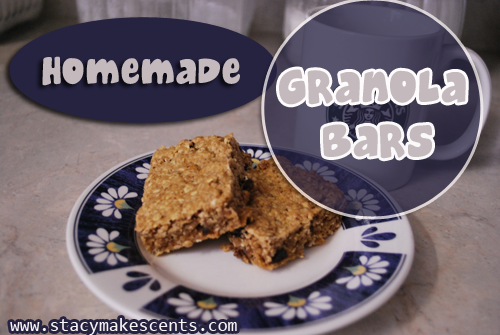 But if you’ve had homemade granola bars; you’ll know the ones from the store can’t hold a candle to them. Embrace the love of granola! It’s ok to admit it. It doesn’t mean that you’ll have to sell your house, go live in a tree and never shave again. Let’s make them, shall we? 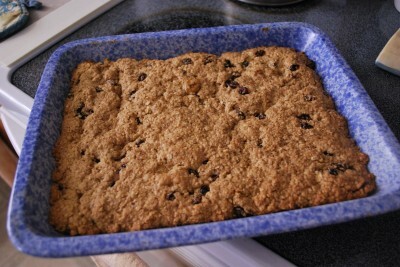 To make these, we’ll need oats, cinnamon, baking soda, honey, sucanat, butter, egg, flax seed, flour, and raisins. Now, this recipe is very versatile. If you don’t like cinnamon, leave it out or substitute a different spice. If you can’t stand the thought of raisins because you used to shove them up your nose when you were a kid, then leave them out. Let your mind run wild! Create a daily flavor, like Ben and Jerry’s ice cream! Chocolate chip and chopped nuts make an excellent granola bar. You could add any type of dried fruit that you want. The bowl is your canvas! Go nuts, add nuts! Dig out your mixer. Realize that you didn’t clean it the last time you used it, so there is fossilized butter specs and cocoa powder residue all over it. Gosh, how could you do something like that? Clean it off and then put your butter and sucanat in a big bowl. Beat it with the now clean mixer until it’s crumbly, about two minutes. Now, add the egg and beat it again. 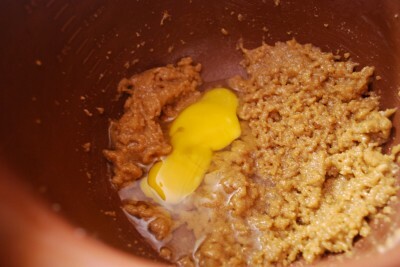 Egg, butter, and sugar…..I think this recipe is really going somewhere! You can put your mixer away now. 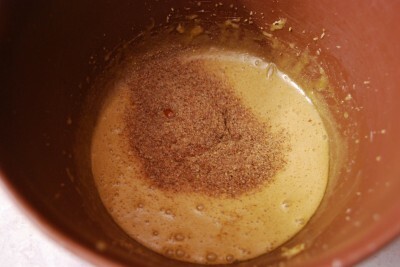 Add the ground flax seed and honey. I know you can’t see the honey in the picture, but it sank to the bottom. It’s a good learning experiment! Honey weighs more than butter, sucanat, and egg mixed. Bet you didn’t learn THAT in school. Stir it up. 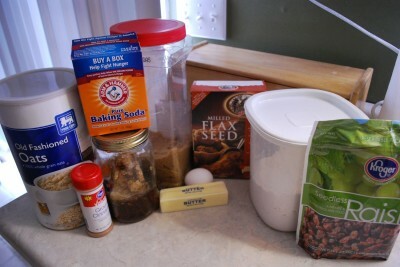 Now you can add your flour, oats, cinnamon, and baking soda. Stir it together just until it’s combined. Man, it smells delicious! My tummy is growling. Now is a good time to eat one of the store bought granola bars since you can’t eat raw egg…..who made that dumb rule anyway? 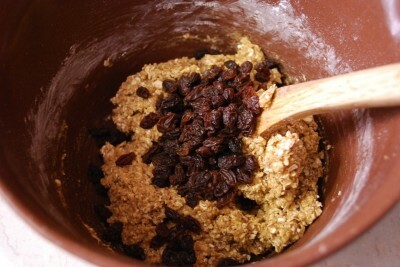 Add the raisins at the very end and just stir until they get incorporated really well. You could substitute Craisins, but mine were in the basement and I didn’t feel like going to get them. I pooped myself out cleaning the mixer. I love raisins though…..I wasn’t weird like my husband, so I didn’t stick things up my nose. Grease an 11×7 inch dish with butter. Dump your granola mixture in the dish and press it evenly. Now, bake the granola bars until they’re golden brown around the edges and set in the middle. Your house smells like Christmas! Cinnamon makes me think of Christmas……it’s Christmas every day in our house. It’s time to brew a pot of coffee and eat your granola bar. They keep very well at room temperature in an airtight container. You probably don’t need to know that though because they won’t last long enough for it to be a problem. Don’t you feel much closer to the earth now? Go hug a tree! 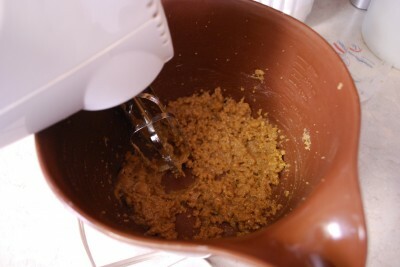 In a large bowl, beat butter and sucanat until crumbly, about 2 minutes. Add egg; beat well. Stir in flax and honey. 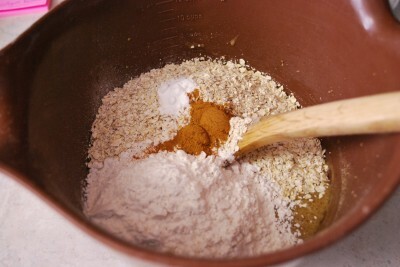 In a small bowl, combine the oats, flour, cinnamon and baking soda; stir into creamed mixture just until blended. Gently stir in raisins. At this point your mixture MAY need a bit of milk to bring it together. I just add a tablespoon at a time to get it to the right consistency, if needed. Press into an 11-in. x 7-in. baking dish coated with cooking spray. Bake at 350° for 14-18 minutes or until set and edges are lightly browned. Ok this is so yummy!!! Tastes great!!!! But mine kinda fell apart 🙁 any suggestions?? Perhaps next time add a bit more liquid. 🙂 And make sure you REALLY pack them down into the pan. Can you tell me if these turn out on the chewy side, or crunchy or in between? I am on a kick of trying recipes, but the last one I made was way too crunchy ans would not like to make another recipe like that. Thanks! Question. What quantity of molasses would I use if I substituted the sucanant? Thank you. It’s kind of a try-and-see thing….because you’re adding liquid to the recipe in place of the granulated sugar. When I use honey, I add 1/2 the amount of sugar called for and then I play around with the other liquids to get the consistency right. We’re not huge molasses fans – I just don’t care for the flavor. That sounds like a great sub though! How much molasses?? I’d love to try! Do you have a THM version of this? 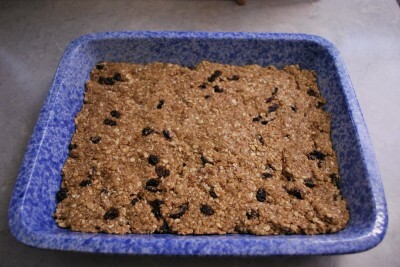 Just made this, substituted flax seed with sesame seeds, and sucanat with raw sugar. Tastes great, thanks!! Best thing about this recipe?? NO NUTS. My son has had an epipen since his first birthday, thanks to nuts, and nut-free granola bars are hard to find. It is rare that I come across a healthy recipe for granola bars that doesn’t call for peanut butter or nuts. I did make some Biscoff granola bars once, but those hardly count as healthy! Thanks, I am pinning this to make soon. I am viewing this page from my android charge mobile and sll text gets cut off on right side. thought you may like to know 🙂 great recipes! I actually just calculated the recipe for nutritional value. I made the recipe in a smaller pan, so I figured 12 servings. Calories: 204, Carbs, 37, Fat 5, Protein 4, Sodium 9, Sugar 49. You said they keep quite well…but can you give me an idea of how long? For example, if I doubled or tripled the mixture, so that I could use them for packing lunches for school for a while? They should keep for a few weeks – but I would likely store them in the fridge. You’re welcome!! I’m so glad you like them! Oh my…these bars are amazing! I’m raising 3 grandsons, who are a challenge to feed on a good day. They were weaned on fast food so they had a hard time making the change to real whole foods when they came here to live. For them, I added chocolate chips! This recipe is on speed dial, as are some of your other recipes. My 40 yr old crock pot is getting a ton of use, just like back when my own kids were this age. Thank you Stacy! Just made this with my little girl. Easy and so YUMMY! White wheat flour is similar to whole wheat flour, but not as dense. You can bake with it just like white flour (http://www.kingarthurflour.com/shop/items/king-arthur-white-whole-wheat-flour-5-lb#3311#) and you get better results than using 100% whole wheat store bought flour. Our family tries to embrace a whole foods lifestyle – we attempt to eat things as closely as possible to the way that God made them. 🙂 That just means less processed foods. Hi there. Thanks for this post. I tried the sugar detox myself. Although I never got off sugar 100%, it’s been three weeks since I had my last piece of chocolate which was my biggest addiction. I am now determined to keep away from choclate and enjoy healthy amount of sugary treats and this recipe seems like it! A couple of questions. Is Sucanat healthier than Maple? The reason I ask is Maple syrup is allowed in cancer diet which my friend’s son is just starting on (I know… it’s so sad…) but I can’t quite figure out how to substitute such liquidy consistency. Also, I wanted to know by how much I can increase flaxseed without ruining the recipe. I figure, more the healthier, right? I really do enjoy reading your blog. Take care! Hello there! 🙂 Maple syrup is just as good as sucanat. I don’t use it as often because it’s quite expensive. When you want to use it instead of dry sweetener, you just decrease the other amounts of liquid. You can also do this with honey. However, honey is strong so you only use half the amount of sweetener it calls for. Be careful adding too much flax seed. It can overpower if you’re not careful. 🙂 Good luck! Did you try this with maple syrup? I love your blatant use of stereotypes. 😉 Found some protein granola bars on closeout just today. Off to hug a tree!